“Gist”: Microgranules of TPU/PS copolymer containing pentane can be expanded into insulation panels using standard EPS equipment. Why it is interesting: Contrary to polystyrene, thermoplastic polyurethane cannot be ‘imbued’ with a physical blowing agent like pentane to make steam-expandable particles. This is due a.o. to the high diffusion rate of pentane (e.g.) in TPU. BASF have now found that by using a TPU/PS copolymer, expandable particles can be prepared which can be used in standard EPS (expandable polystyrene) equipment to make insulation panels. The TPU used is based on 4,4′-MDI, polyTHF and butanediol such that the vicat softening point is below 80°C. 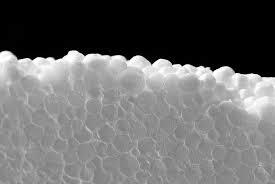 The TPU, in the form of microgranules (0.5-2mm), is swollen in styrene containing dicumylperoxide, dispersed in water and heated to polymerisation. A blowing agent like (pref) pentane is added to the dispersion as well. The resulting particles are expandable and can be used to make insulation panels of 50-150 kg/m³.